Regular gutter cleaning is an essential part of your home maintenance routine. If neglected, you could be looking at a monumental repair bill should stormwater seep into your basement or crawl space and damage the foundations of your home. Thankfully, however, the task is relatively straightforward and can be undertaken by anyone in a reasonable physical condition. But it’s not without its dangers, so it’s essential to play it safe. If you try cleaning your gutters on a hot summer’s day in Australia, you’ll likely pass out from heat exhaustion before you’re done. Likewise, you could slip and fall if you attempt to do so, during or right after it rains. Wait for reasonably cool, calm and dry weather first. The best option for a one-story residential home is a sturdy four-legged stepladder with anti-slip rubber feet. An extension is required for a two-story house. Always ensure the ladder has been placed on flat ground and is level. The surface should be hard rather than loose soil. If that isn’t possible, put a hard plank of wood underneath. Never rest the ladder on the gutters because it could easily buckle under the weight of a person as they climb to the top. While climbing, always have two feet and one hand on the ladder to keep balance. If possible, get another person to hold it from the bottom. The annoying thing about using a ladder to clean your gutters is that you constantly have to climb up and down to move it. As tempting as it may be, don’t overextend your reach because you might slip, which would be disastrous at such a height. It is possible to clean out your gutters by hand, but it’s not the best method. Instead, head down to your local hardware store and invest about 10 bucks in a gutter scoop, preferably one with a long handle. Before you do, climb up and measure your gutters. Gutters and gutter scoops come in all different sizes, and you definitely don’t want a scoop that’s too big for the gutter. With a good long handle scoop of the proper size, you’ll be able to get the job done much quicker. Gutters fill up with gunk and mould which stinks and can cause damage over time. To get rid of it, use a long-handled brush and scrub vigorously. Using a pressure system is all too tempting as they can get the job done super quick. However, these rather bulky bits of machinery can be very difficult to balance as you climb up and down a ladder. Stick with the traditional method to stay on the safe side. A gutter cleaning wand is a long pole with a high-pressure nozzle at the end that allows you to clean from the safety of the ground. A gutter robot, on the other hand, is kind of like a Roomba that slides along and cleans your gutters. Although both are virtually 100% safe, the end result won’t be as good as if you cleaned it by hand. 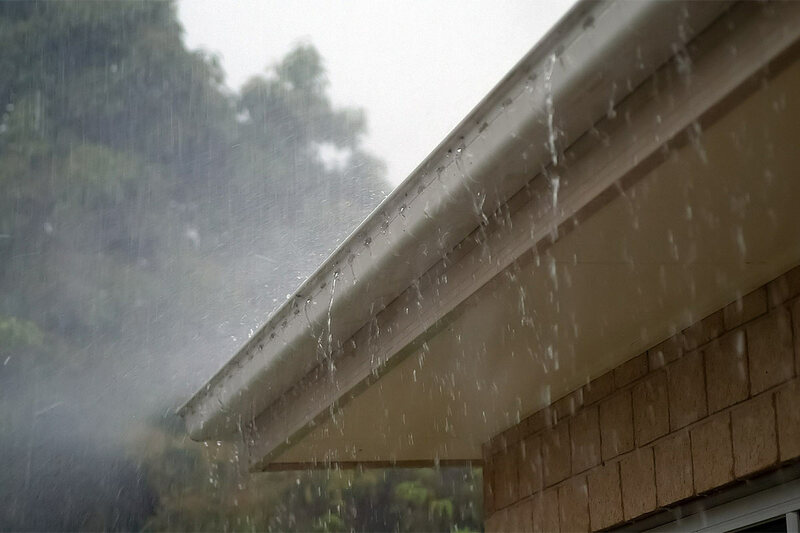 The safest way to clean your gutters is to hire the help of a professional gutter cleaning company. A reputable outfit will know exactly what they’re doing and will have the necessary equipment to make your gutters spotlessly clean.